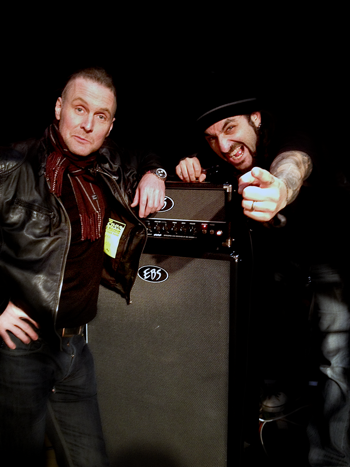 EBS Artist Jonas Reingold and Mike Portnoy with the EBS rig on the tour. Europe has been blessed, seeing an epic tour with some of the finest musicians in progressive rock sharing the same stage flooding over the continent. EBS is proud to have been part of the event that featured the Flower King’s, Neal Morse Band with drum icon Mike Portnoy and an encore with music from Neal Morse, Roine Stolt and Mike Portnoy’s supergroup Transatlantic, supported with musicians from both of the bands, presenting a total 3,5 hours set of finest progressive rock! Both bass player’s on the tour, EBS Artist Jonas Reingold and Neil Morse bass player Randy George played through an EBS Classic 450 head with a Classic 810 cabinet, as well as a pedalboard with the complete line of EBS Black Label effects. Add to that, Flower King’s keyboard wizard Tomas Bodin using two EBS Reidmar heads and 4x EBS Classic 112 cabinets to power his key’s on stage! The Transatlantic encore at the opening gig in Stockholm, feat Jonas on the bass. Most of the shows on the tour where completely sold out, and it also had a few suprises at hand, including legendary Steve Hackett from Genesis joining both bands on stage for the Transatlantic encore at the London Show! If you where lucky to see the shows, we share your luck, if not, there are plenty of videos out there on Youtube for you to find! Flower Kings preparing for the tour at Diversify Music Group in Stockholm.